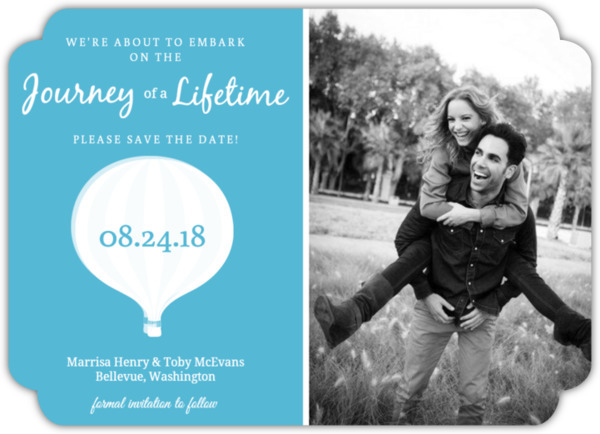 What is a "Save The Date" Card? A save the date card is an item, usually a card, sent to people to let them know when a wedding date will be. Most people use save the date cards, stationery or magnets to let their future guests know when they plan to get married and sometimes where (especially if it is a destination wedding) so their guests can mark it on their calendars and plan ahead for your wedding! Is it always a card? No. Usually save the date is a card; however other items can be used instead such as magnets.These days there are many different options. The most common are postcards, magnets and stationery that resembles wedding invitations. Besides the different types of ways to send them, there are so many different styles you can choose from. 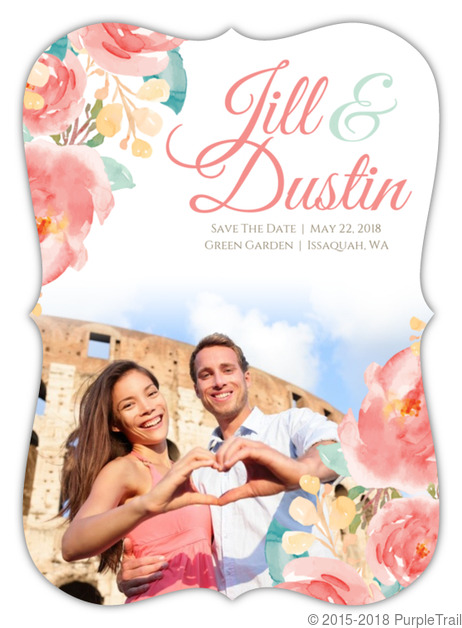 You can send save the date cards that are traditional or modern, you can choose to match your color schemes or wedding themes or send ones with photos of the happy couple. Who Should Send a Save the date card? Anyone who has out of town guests or a long engagement. If your wedding engagement will be at least 6 months or longer, it is a good idea to use save the dates as there is a good amount of time between announcing your engagement and walking down the aisle. How long should your send them before the wedding? 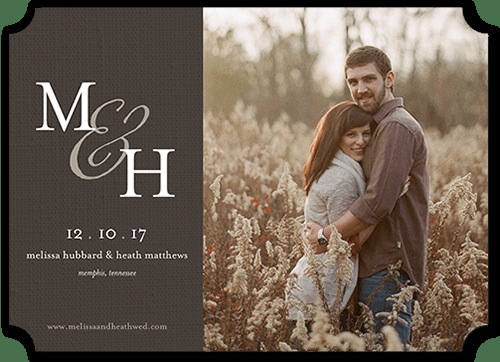 Save the date cards should be sent at least 6 months before the wedding. Save the date cards can run from basic to extensive. They can just say the bride and grooms name and the date they plan to wed or they can follow a more traditional wedding style adding information such as church or reception locations. Sending a save the date card is completely optional, it is not essential stationary such as invitations and thank you cards. However it can be a nice touch especially when you have a longer engagement or several people coming in from out of town. 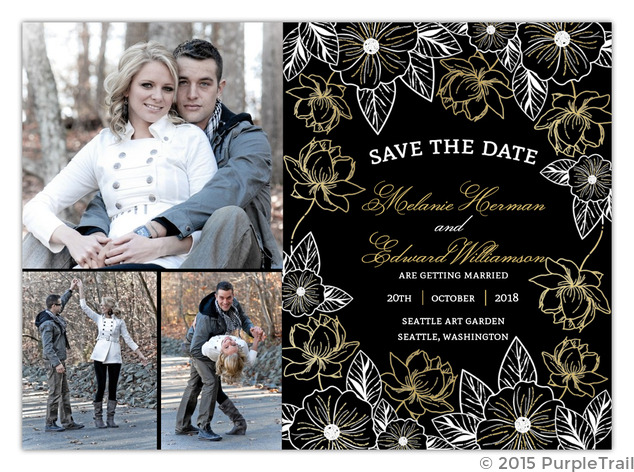 There are many different styles of Save the date cards and magnets available. When you are ready to shop it is a good idea to know what you are looking for. We are going to discuss and showcase a few of the more general styles. 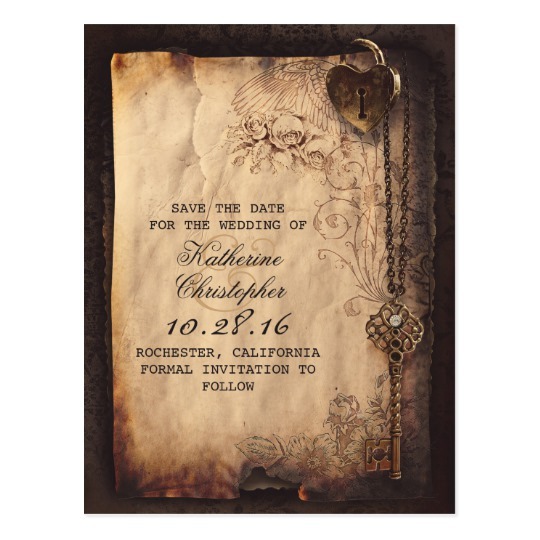 One popular style is choosing vintage save the dates. You can choose this style to use by itself or you could also incorporate a vintage theme into your wedding. Looking for vintage - how about this super cute lock and key on vintage looking paper? It is vintage with a touch of romance. 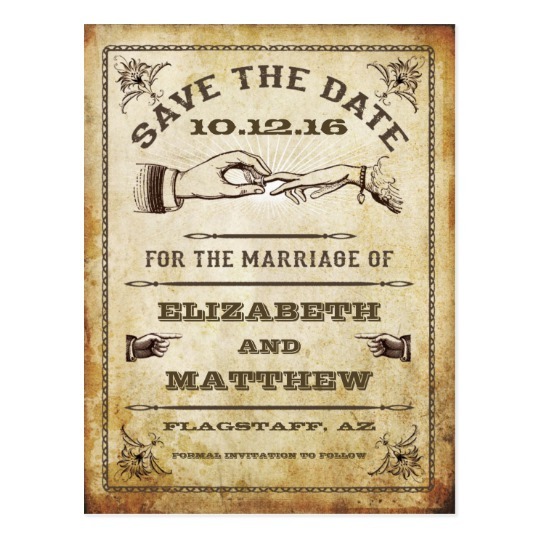 Looking for a different kind of vintage save the date card? What about this cute vintage looking husband putting the wedding ring on the wife's hand? Are you looking for a more modern look to your wedding stationery? If your wedding has a modern theme you are going to want all your stationery to have the same feel. Using photos in your wedding stationery is a popular way to go. Having photos on your wedding stationery is another great way to turn your stationery into long lasting keepsakes. The style below has a black and white photo on one side and a nice blue and white modern design on the other side. 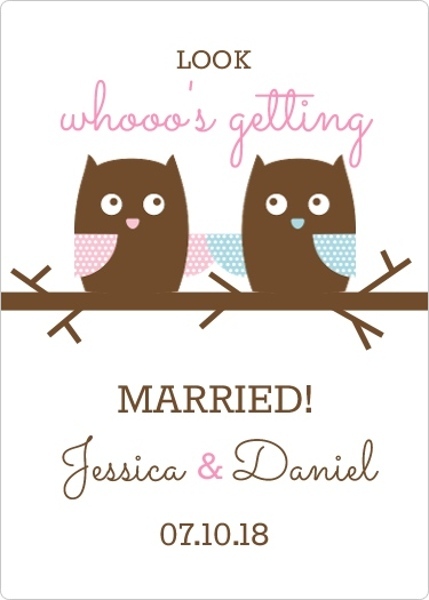 Is a save the date card or magnet not exactly what you are looking for.? What about a save the date booklet? This is a great and fun way to let everyone know when your wedding is, it is different and super modern and colorful. Are you having a rustic wedding? Many people choose to have a more rustic wedding theme, they do not want modern or traditional as this does not fit their lifestyle or personality. If this describes you, you might want to choose rustic wedding stationery to match your theme. 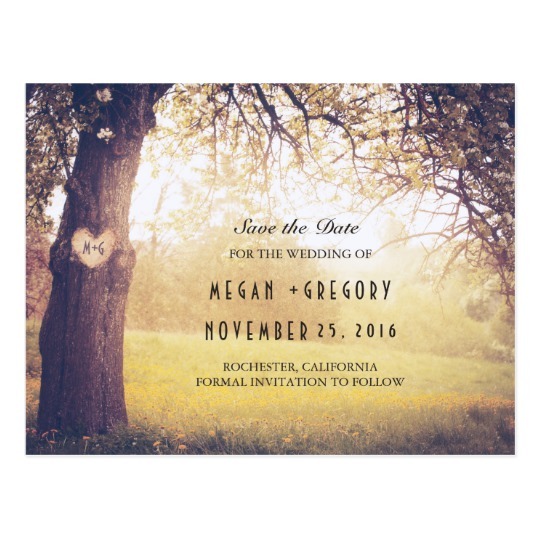 The save the date below matches the rustic theme with a beautiful tree with your initials carved in it in a sun soaked meadow. 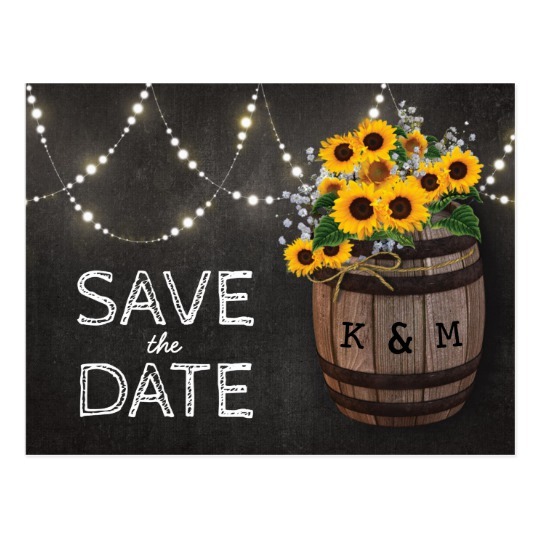 Still looking for options - below is another cute save the date with a rustic feel. It includes string lights and a wooden barrow with sunflowers. 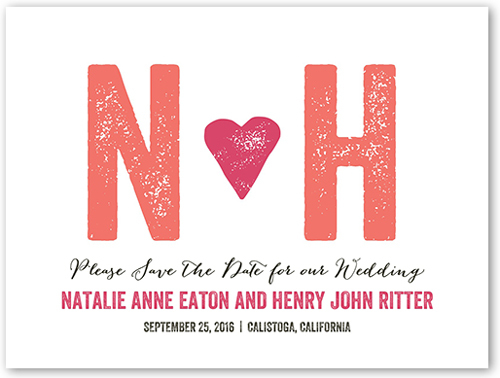 Another popular save the date style is including the use of monograms in the stationery. Monograms are usually a traditional element in stationery but it can also be pretty modern as well depending what the rest of the card looks like. Below is a good example of how you can take monograms and make put them on a much more modern card. 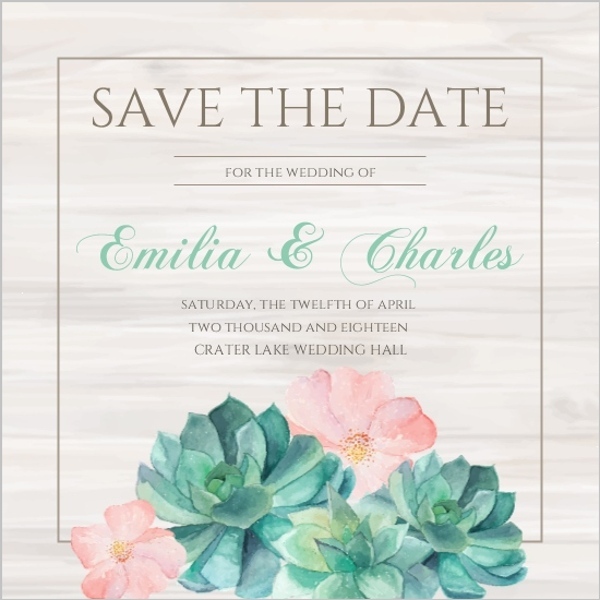 The look and feel of the save the date below is colorful and bold, outside of the use of monograms there is nothing traditional about the style at all. The card below is more of a minimalist style. About 60% of the card is saved for a lovely photo of the two of you and what is not a photo is simple - your monograms, the wedding date, your names and the city and state of your wedding. 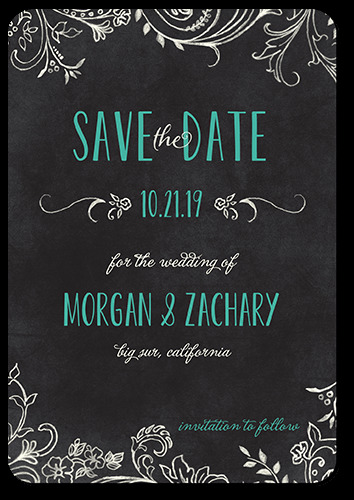 The last save the date style we are going to talk about could also fit under modern, but it is it's own subset of modern - the chalkboard invitation. In recent years having a design of the wedding stationery look like a chalkboard has become increasingly popular. It could be black and white, black and green or have additional colors. But the idea is fun and fresh and best of all, it allows you to also think of ways to incorporate this design in your wedding. Many weddings have chalkboards outside the reception or the ceremony for some additional decoration and design elements. Here is a basic design the incorporates other colors besides just black and white. It is simple but gets the point across. 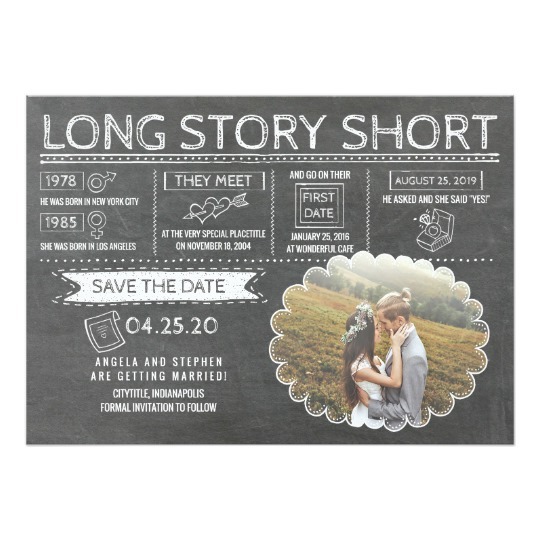 Looking for a chalkboard designed save the date but want something rustic and colorful? 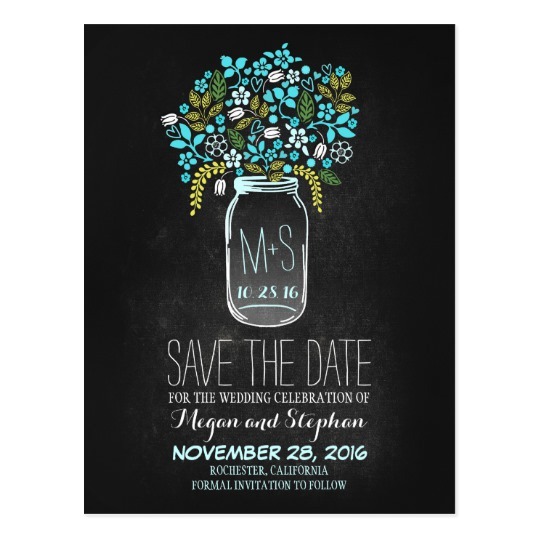 How about this beautiful design that includes a monogrammed mason jar with a bouquet of flowers? Looking for a chalkboard invite but want something cute and fresh? What about this long story short save the date which lets your guests know when and where each of you were born, when you met, when you went on your first date, when the proposal happened and when the wedding will be. It also features a photo of the two of you! As you can see there are many different ways you can let your wedding guests know when the wedding will be. 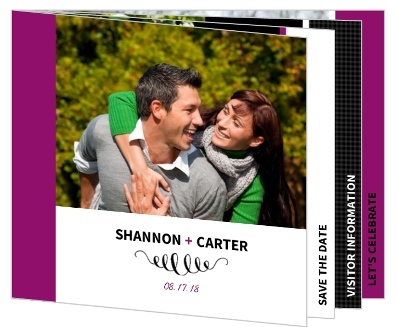 Hopefully now you have an idea if you going to send save the date cards and what style you most gravitate towards.